A study published in the Journal of Maternal, Fetal and Neonatal Medicine, claims 50 gram glucose challenge testing results in an increased number of false-positive tests in twin pregnancies. Researchers reviewed results from both 50 gram glucose challenge test and 100 gram glucose tolerance tests performed on women pregnant with singletons and multiples (twins) for the study. Researchers from the Helen Schneider Hospital for Women were involved with the retrospective investigation. 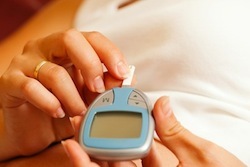 More than 14,000 glucose test results were available for the study. The majority of the test results were used as the control group – singleton pregnancies (14,268) with just 529 twin pregnancy glucose test results available for comparison. Results from the 50 gram glucose challenge tests were elevated in twin pregnancies, but not all women with elevated test results went on to develop gestational diabetes. Positive 50 gram glucose challenge test results should be followed up with additional testing to rule out false positive results. Source: Yogev Y, Eisner M, Hiersch L, Hod M, Wiznitzer A, Melamed N. The Performance of the Screening Test for Gestational Diabetes in Twin versus Singleton Pregnancies. J Matern Fetal Neonatal Med. 2013 Apr 26.